Through SE4ALL, the District Energy in Cities Initiative can play a critical role in addressing climate change over the next decade. The International District Energy Association (IDEA) is proud to support the launch of the “District Energy in Cities Initiative” under the Global Energy Efficiency Accelerator Platform of Sustainable Energy for All (SE4ALL), a global initiative of the United Nations Environment Programme (UNEP) at the UN Climate Summit in New York City. 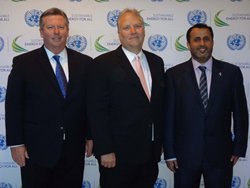 The "District Energy Accelerator" was announced in conjunction with the UN Climate Summit on September 23, 2014 and leaders of IDEA, District Energy St. Paul and Empower were on hand at the United Nations to participate. "The International District Energy Association has seen a significant increase in interest about district energy among mayors, planners and community leaders seeking proven and scalable solutions to cut emissions, strengthen resiliency and increase energy efficiency. District energy systems can achieve all three objectives for cities while simultaneously generating substantial economic benefits for the local economy,” says Rob Thornton, CEO of IDEA. “We applaud UNEP for recognizing the importance and potential of district energy as a proven, near-term sustainable energy solution for cities and communities." "District Energy St. Paul owns and operates the largest district hot water system in North America in conjunction with district cooling and combined heat and power (CHP). We have successfully integrated multiple sustainable energy technologies such as urban wood waste, solar thermal and energy storage. We look forward to sharing our experience with cities and communities in deploying district energy as a supporting partner with the UNEP Global Energy Efficiency Accelerator Platform," says Ken Smith, CEO of District Energy St. Paul and current Chair of IDEA. In many emerging economies around the globe where air conditioning is vitally important to productivity and quality of life, district cooling systems can dramatically improve energy efficiency, reduce demand on the electricity grid, cut emissions and conserve valuable water resources. In regions like the Middle East, where over 70% of the electricity generated is used to produce air conditioning, focusing on highly efficient air conditioning for cities produces both economic and environmental benefits. "At Empower, we have built one of the world’s largest district cooling systems to support the sustainable development vision for Dubai. In only ten years, we have developed over 60 plant rooms in Dubai with total cooling capacity of nearly one million tons refrigeration, operating at efficiencies of 40% to 50% higher than traditional air conditioning equipment. Because of our scale and integrated approach, we can also utilize grey water or treated sewage effluent (TSE) for our cooling towers, conserving huge volumes of fresh water for other purposes," says Ahmad Bin Shafar, CEO of Empower. "We are eager to share our experience in designing, constructing, operating and optimizing district cooling systems with other cities and communities across the region and around the world. In fact, we are honored to invite interested parties to join us at the International District Cooling Conference in Dubai, December 14-16, 2014 as we host delegates from around the globe with tours of our state-of the-art facilities," says Bin Shafar. District energy systems facilitate integration of multiple sources of energy and can unlock local opportunities such as surplus industrial heat, biomass, waste to energy and renewable district cooling from nearby lakes, rivers and oceans. Because a district energy system aggregates the heating and cooling needs of dozens, hundreds or even thousands of customer buildings, it unlocks opportunities for highly efficient combined heat and power (CHP) and allows local economies to capture the economic multiplier effect of utilizing local indigenous resources. District energy is widely deployed in cities across North America and Europe and is growing dramatically in the Middle East and China, but there is still tremendous opportunity for growth and expansion near term. The District Energy in Cities Initiative, coordinated by UNEP and Danfoss, will support national and municipal governments in their efforts to develop, retrofit or scale up district energy systems, with backing from international and financial partners and the private sector. The initiative will bring together cities, technology providers, academia and financial institutions in a joint ambition to make tangible progress in cutting emissions. This partnership is intended to expand awareness of best practices and technologies and accelerate the transfer of know-how to stakeholders. Thus far, 19 cities around the world have indicated interest in joining the initiative including St. Paul (United States), Dubai (United Arab Emirates), Vancouver (Canada), London (United Kingdom), Paris (France), Anshan and Jinan (China), Seoul (South Korea), and Nairobi (Kenya). In addition to Danfoss and UNEP, 11 other private sector partners are willing to join the initiative, along with government organizations and networks including the US Department of Energy (DOE) and ICLEI, and intergovernmental organizations like UN-Habitat and the International Energy Agency. "Through SE4ALL, the District Energy in Cities Initiative can play a critical role in addressing climate change over the next decade," said Thornton. "Mayors and city leaders are stepping up to the climate mitigation and adaptation challenge. They are seeking practical, realistic solutions to tackle climate change and to strengthen the resiliency of their local economies. IDEA encourages governments and our global industry partners to collaborate through the Energy Efficiency Accelerator to deploy district energy infrastructure for more sustainable cities tomorrow." National and Municipal Governments: Anshan (Liaoning Province, China), Betim (Brazil), Bogotá (Colombia), Focsani (Romania), Helsinki(Finland), Jinan (Shandong province, China), London(UK), Milano (Italy), Nairobi (Kenya), Paris (France), Quito (Ecuador), Recife (Brazil), San Jose (Costa Rica), Santiago de Cali (Colombia), Seoul, South Korea, Sorocaba (Brazil), St. Paul (USA), Department of Energy (USA) Vancouver (Canada)and Vaxjo (Sweden). Partners are working together to prepare good policy, finance and technology guidance on district energy systems. More information on the District Energy in Cities Initiative is available here. District energy systems achieve operational efficiency gains up to 90 percent. District energy infrastructure supplies nearly 10 percent of the total heat demand across Europe, resulting in approximately 113 million tons of CO2 savings each year. District energy has the potential to reduce carbon emissions by 35 gigatons over the next four decades. According to the International Energy Agency, the investment needed to maximize energy efficiency with district energy is $3.4 billion, with potential savings of $6 billion. The International District Energy Association (IDEA) is a nonprofit 501(c)(6) industry trade association founded in 1909 and governed by a 22-member Board of Directors. IDEA represents approximately 1800 members who are district heating and cooling executives, managers, engineers, consultants and equipment suppliers from 26 countries. Association members operate district energy systems owned by utilities, municipalities, hospitals, military bases and airports throughout North America and around the world. Visit http://www.districtenergy.org for more information.